Since 1976 we have taken pride in every custom seat cover we manufacture. Our custom seat covers are produced from start to finish in the United States. Our fabrics are the finest, most durable and aesthetically appealing in the automotive industry. Our pattern experts are constantly creating new seat cover patterns as new-year models are released. Ruff Tuff initially produced only saddle blanket seat covers. Since then our line has expanded to include Velour, Tweed, Neo-Supreme, Carbon Fiber, Sof-Touch simulated leather, Perforated Sof-Touch, Dura EZ Care, Exotics, and a variety of Camo patterns including Realtree, Mossy Oak, and Kryptek custom seat covers. The quality and durability of the materials we use are the best in the industry. A combination of outstanding customer service, high quality materials, and an all around sense of pride in our products is what makes our custom seat covers stand out from the crowd and has resulted in many satisfied customers. 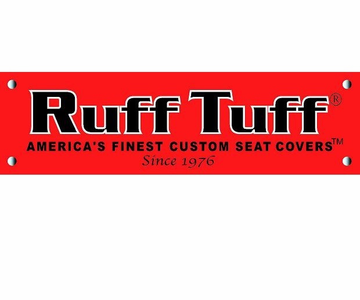 Each custom seat cover we produce at Ruff Tuff Products must live up to these high standards developed over the past thirty plus years of being in business. If you are looking for quality that surpasses all of the competition, give us a try. Headrest and armrest covers are sold separately. An armrest cover is included with 40/20/40 bench seats.